Syabas together with RealD will bring 3D support to its network HD players Popbox and Popcorn Hour. That possibility will allow to playback 3D video from local storage or network shares as well as from online video services. It’s planned that Popbox will have 3D support after release and Popcorn Hour A-200 and C-200 will get it with firmware upgrade. Popbox looks very attractive. Even now it can be pre-ordered just for $129.99! It’s good price for HD and 3D support as well as access to the online services such Revision3, Facebook, Twitter, ShoutCast, blip.tv and more. Base LinuxMCE distribution includes Sqeezebox Control Center aka SlimServer. It allows to build multi-room audio system very easy. But Squeezeboxes are not so cheap as we’d like. So, Dianemo developers (company which offers commercial installations of LinuxMCE and returns back to community a lot of new and fixed functionality) implemented support of several sound cards (including USB ones) on one core or media director. Each card has one Squeezeslave (software implementation of Squeezebox) associated with it. As result using cheap USB sound cards you can build multi-room audio system. Code to implement SoftAudio feature will be added to the project repository soon. So, hope we’ll have it in some new 0810 update next month. 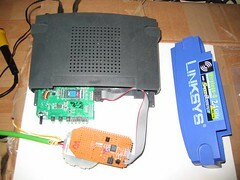 Using of WiFi router as a controller of DIY home automation system is a good idea. It’s energy efficient, noiseless, reliable, compact and you don’t need additional device. Good example of commercial realisation of that approach is a Z-Wave controller MiCasa Vera, based on WiFi router Asus WL500G Premium. There is also a few DIY projects utilized routers. One of them is Linknx. As a base Linknx uses a Linksys WRT54GS wifi router running OpenWRT or some other ones from this list. That project is oriented to KNX/EIB technology. To communicate with KNX/EIB devices a home made-interface is used. Users have a good-looking web-interface with Ajax to manage the system. Its live demo version is available here. If you’re building KNX/EIB smarthome system by yourself Linknx might be good option for you. Another interesting project Home Automation Hub (HAH) is based on cheap WiFi router Livebox. It uses xAP home automation protocol which can be integrated with X10 or C-Bus devices. Integration with 1-Wire bus and I2C bus is done by adding interfaces for them. Also there is a RF transmitter to communicate with cheap RF modules, AVR micro-controller, four relays, a set of input lines and LCD display. The HAH includes software modules for integration with Twitter (can be used as a transport for notifications), Google Calendar and Pachube and offers possibility to send SMS via connected old Nokia mobile phone. HAH is a green project because first of all its power consumption 6 Watts only. And secondly, it reuse old hardware. A short resume is following. If you need a plug-n-play solution then Vera is your choice. It’s ready made budget solution, used modern Z-Wave technology. If you’re DIY-er and smarthome enthusiast then Linknx or Home Automation Hub might be your choice. They need some customization of hardware but also give an open source flexibility and freedom. As you may know the modern TVs allow to watch media content not only from local sources but from network shares or online services as well. But producers limit functionality. For example, to get media content from the network share only DLNA can be used. UPnP or Samba are not supported at all. But thanks to open source enthusiasts there is a way to get more from your TV. Project SamyGo offers alternative firmware for the Samsung TVs. Using this firmware you’ll able to mount NFS or CIFS/SAMBA network shares, receive media content from UPnP servers, use WiFi adapters 3rd-part companies, activate PVR functionality. Additionally you’ll have telnet access to your TV and ability to run custom scripts when TV switched ON. 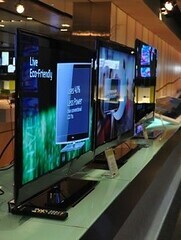 Another project openlgtv offers alternative firmware for LG TVs. It also offers possibility to mount NFS or CIFS/SAMBA network shares supports UPnP and much more. Using USB Ethernet adapter you can add your TV in the local network even it doesn’t have built-in Ethernet port! There is another project for LG TVs – LGMOD v1.2, which additionally offers a web interface to configure your TV. It’s good to see that consumers have a choice between limited official firmware and alternative one offered much more features. And number of those features is increased continuously. This brief howto explains clearly how to install XBMC on Ubuntu 9.10 Karmic with supporting of hardware acceleration VDPAU and integrate it with Video Disk Recorder (VDR) – popular software to build receiver for digital TV. All installations are done using packages which is much simpler that build everything from the sources. The integration between XBMC and VDR is done via VDR streamdev-server (there is an another approach based on scripts to switch between XBMC and VDR). Except installation instructions that howto contains very useful diagram of XBMC LIRC remote action mapping (see it below). As you may see setup of LIRC remote control under XBMC is not so easy task as for the rest HTPC software. Many thanks to author for clarification of that important aspect! If you have some troubles with VDR installation here is another howto which might help you to setup VDR with VDPAU support under Ubuntu Karmic.